Don't you just love the wonderful season coming? Spring with it's promise of renewal and the celebration of our sweet Savior and His promise of everlasting life! in a vintage/shabby chic style. Guest Designer spot with the team. My card uses a lovely image that I received a good while back from Magic Moonlight Free Images , isn't she lovely? For inspiration I decided to join my old (and that means previous, lol) design team mates at Sweet Sketch Wednesday using this week's sketch. My papers are all from the K and Co McKenna paper pad along with card stock from Stampin' Up. My trims are from a local fabric outlet with the old olive ribbon from SU. Looks like everyone is ready for Spring. Please stop by at Sugar Creek Hollow and see our cards and then get yours entered for a chance to win this week. Gorgeous card, Patti! I love the soft color and the beautiful vintage image! Wonderful design and details! Lovely card! I like the doily peeking out!! Such a beautiful card. Love all the lace and your beautiful flowers. Thanks for joining us at SSW. Such a gorgeous card Patti, I love every little detail of it. I hope you are doing well. Think of you othen. Oh my is this not wonderful or what! So much to like; the fabulous lace and doily, the vintage image and the lovely flowers. Fabulous job! Hi Patti. What a stunning card! So many beautiful touches. Thanks for joining us at Sweet Sketch Wednesday. Such a beautiful card! Love the lace, flowers, and your panels..so lovely! WOW! Patti this is gorgeous, love the flowers and sketch! Beautiful card, the image looks so sweet. Beautiful lace on this Patti and such a soft, feminine design. Hi Patti! This is a gorgeous Easter card! Love it! Thanks so much for joining us this week at Sweet Sketch Wednesday. Gorgeous card, so cute. Love the colours and your design...Thank you for joining us at Sweet Pea Stampers this month and hope to see you again..Good luck. Wonderful soft colors and great sketch to work with. So good to see you playing here Patti! This is an absolutely gorgeous vintage card. Beautiful with the lace and the doily. Hope you're doing well. Thanks for playing along with us at SSW! Wow Patti what a totally amazing card. This card is so pretty and what a great image wonderful colours and embellishments. 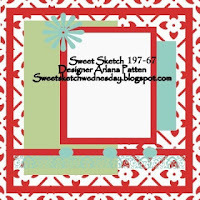 Great card and thanks so much for sharing it with us at Sweet Sketch Wednesday and good luck. It's so nice that you joined us this week. Gorgeous vintage card Patti, beautiful image and papers. Gorgeous!! Love the image!! Thank you so much for playing with us this week at QKR Stampede! We can't wait to see what you'll create next time!! This is beautiful, Patti. Gorgeous embellishments and lovely colors. The image is so pretty. Lovely! Thanks for joining s at Polka Doodles.